The first thing you should know about this candle is that it smells likes a double gin and tonic. I could even go as far as saying that the Juniper and Cedarwood Candle smells like enjoying a gin and tonic by the fireplace. That probably sounds a bit contrived but if you could smell this, you'd totally understand! Gin is made from Juniper berries so it makes sense that the fragrance is going to somewhat resemble the cocktail while the addition of Cedarwood creates that toasty Autumnal feel. Perfect for candle lovers who enjoy rich, woody fragrances, the candle also features notes of Bergamot and Vetiver to complete the scent beautifully. 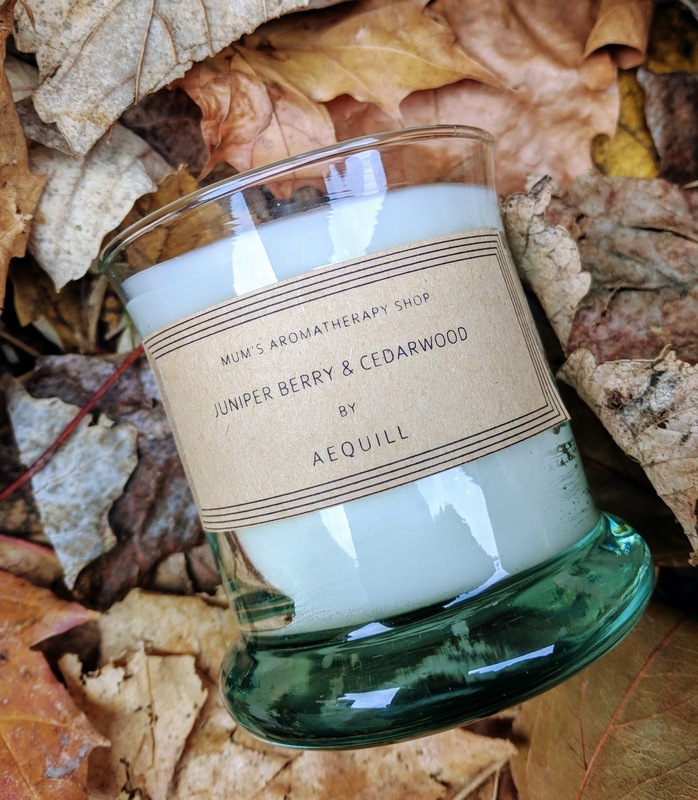 The Juniper Berry and Cedarwood Candle is part of Aequill's 'Mum's Aromatherapy Shop' range which founder Jintana Khieochuam created after being inspired by helping her mum blend essential oils in her beauty shop. Other candles in the range include Grapefruit and Vetiver, Lavender and Marjoram, Lemon and Rose Geranium and Orange and Ylang Ylang. The candles are paraffin wax based for optimum scent throw. I think the backstory of Aequill as a brand is quite nice- Jintana was born in Thailand and moved to London with her mother who owned a beauty therapy clinic. Growing up, Jintana was surrounded by essential oils and was intrigued by their therapeutic properties. Her interest in essential oils coupled with an obsession with candles gave way to the inception of Aequill, which is based on the idea that old and new worlds need to collide for a sustainable balance. Like the rest of the range, the Juniper Berry and Cedarwood Candle is presented in a 100% recycled glass jar and is hand poured. The traditional apothecary feel of the packaging is inspired by Jintana's first job in a chemist. To finish, each box is hand-stamped with a wax seal. Gorgeous. 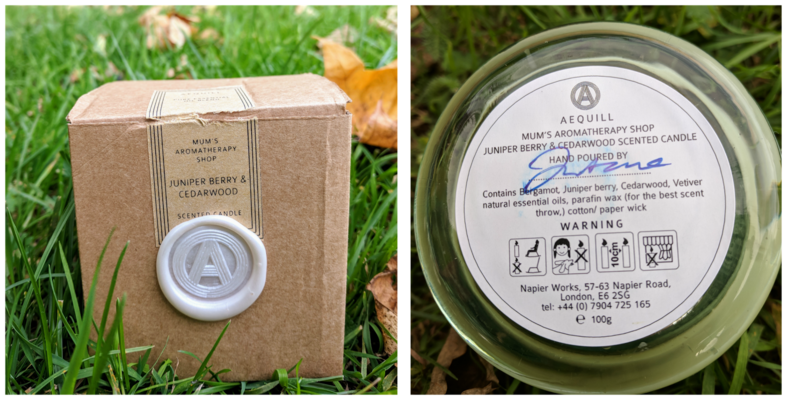 Aequill 'Mum's Aromatherapy Shop' candles are available in regular (approx 200g) for £24 and travel size (approx 100g) for £14. Interestingly, Aequill also offer an eco-refill service which I think is a very cool touch. You can read more about Aequill and find stockists here.